Though short and concise, Ezra Pound’s In a Station of the Metro is the perfect representation of Pound as an individual. The most prominent component of this poem that develops a further understanding of Pound is the use of imagery. The phrase, “Petals on a wet, black bough,” paints a clear picture to readers who can empathize with the emotions of seeing one familiar face in the midst of a blaring crowd. 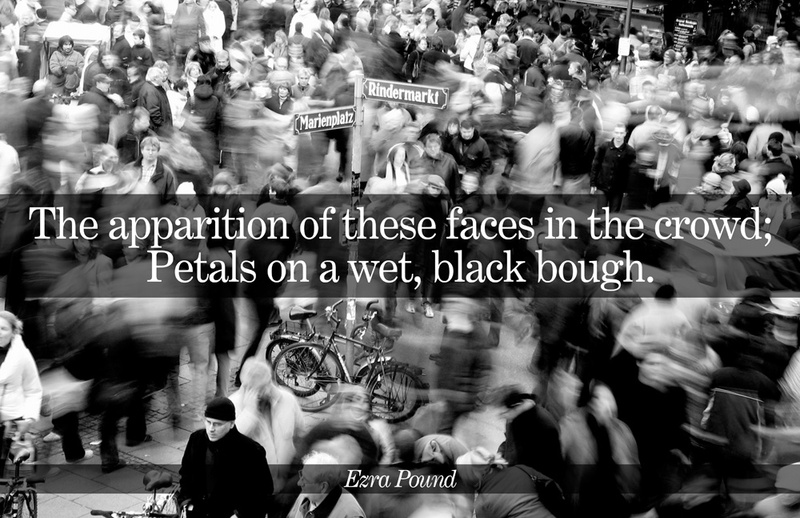 On the contrary, Ezra Pound is intentionally vague with his two-lined poem, especially when he calls the faces “apparition[s].” By using this word, Pound causes readers to question whether these faces are real or actual apparitions/ghosts. In relation to Ezra Pound’s life, In a Station of the Metro parallels his involvement with the Imagism Movement. During his life, Ezra Pound was an affluent member of the Imagism Movement, which worked towards making poetry and art more direct with regards to interpretations and meaning. This can be seen through Pounds use of imagery to directly portray emotions and the image of seeing one familiar face in a crowd. However, when Ezra Pound left the Movement, this caused a dramatic change in his techniques of writing and shifted his work into having abstract or difficult interpretations. This can be seen when he calls the faces apparitions, which causes uncertainty in his audience. In all, In a Station of the Metro displays the different influences of Pound’s life and how he adapts these influences into his poetry. Though this is just one poem, all of Ezra Pound’s poetry reflects upon his thoughts, beliefs, and opinions. This entry was posted in Honors English III, Uncategorized and tagged american poets, Ezra Pound, figurative language, imagery, Imagism, Imagism Movement, In a Station of the Metro, Poetry. Bookmark the permalink. Your use of the media in your post really illustrates the true poet Pound is. I would love to know more about Pound’s early life and wonder how it impacted her poems.